What makes the perfect snare? Transient: The moment the stick hits the skin of the drum, the initial attack. I generally don’t have too much low content here and is fairly flat from the mids to the highs. You’d be surprised at how much sonic information in relation to the character is delivered in these first few milliseconds. It’s important to consider the length of this layer, too short and your snare will sound synthetic, too long and you will lose the perceived “punch”. Body: The body of a snare sits at 200hz above the kick at 100hz. I tend to mix the low frequencies of the snare and kick equally to -10db. Be careful not to isolate 200hz too much as the lower mids are crucial for providing warmth and realism. I often boost around 500hz which can help distract from that classic “too much 200hz” vibe. Sometimes adding a very subtle low-passed acoustic live snare layer here can add a nice aggressive feel and help glue things together. Tail: This is where your high frequency content sits from the upper mids to the top end (1000hz – 10khz). The release of this can be extremely crucial to the “roll” of the drums. It’s important to keep your top end nice and controlled – too much top in this region can make your overall drum mix irritating. Lately, I’ve been making this decay very tight whereas in the past I’ve gone for a very splashy top, layering with white noise and cymbals. It’s popular at the moment to add a peak at 1.5khz to emphasise the character of the upper mids (check out Wilkinson & Culture Shock). This can really help pull the snare out of the mix in an area otherwise dominated by musical parts. The perceived “punch” of the snare is achieved by the dynamic relationship between these elements. For example, a slight fade on the tail can give the transient more emphasis. It’s a very careful balance. Sidechain compressing the body and / or the tail to the transient with a very fast release can also give nice results. I prefer to use volume envelopes to sculpt the dynamics as this gives you more control. Ultimately, your snare needs to sound convincing – if you are finding things are sounding too artificial, try adding some live drum layers to give a more “humanised” feel. 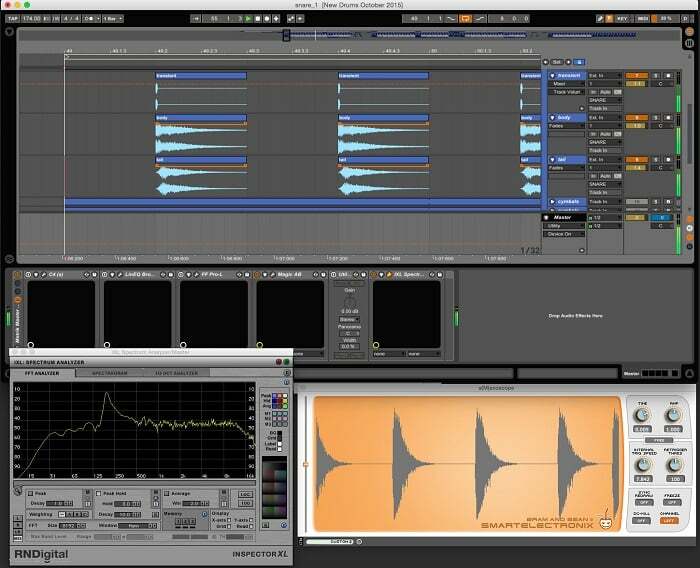 Here is a screengrab of a snare I’m working on in a current project where you can see the three individual layers. It can be tempting to solo the snare and work on it without any context so including the rest of the drums in the mix can help a lot. It’s also useful to include the bass and synths as musical elements can be highly suggestive to the character of the snare. Finally, experiment. Sometimes seemingly unorthodox and extreme techniques can lead to great results. Once you’ve established your layers, liberally apply plugins (compressors, saturators, distortions, reverbs, phasers etc.) and see what comes out on the other side. Hopefully you will arrive at something which characterises your productions. Who makes the perfect snare? I’ve always been impressed with Rob Swire’s snares and his drum engineering in general. He achieves a pleasing level of punch without sounding offensive yet maintaining a realistic organic feel. I’ve often tried to emulate this aesthetic with my own drums; heavy hitting with soft transients and glossy tops. Writing an article on snare drums wouldn’t be complete without mentioning Sub Focus and Culture Shock who also have some of the best snares in the game IMO!